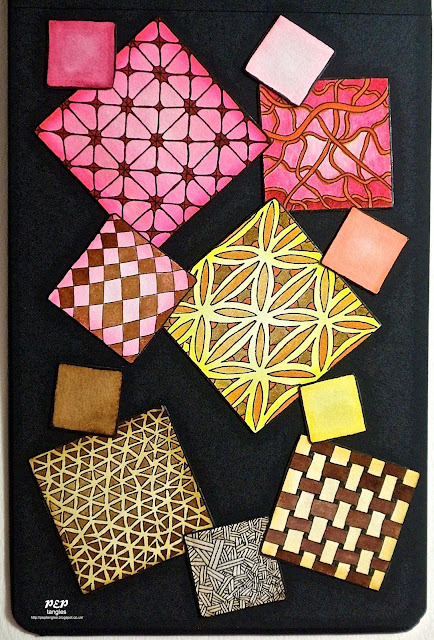 May's Challenge (Number 14) for the Chocolate Baroque Zentangle Group is to create a tile or ZIA based upon a square string of our choice. I couldn't resist working on a ZIA using the techniques I've been learning during the MCC Time to Tangle with Colours course. I decided to use warm colours this time & to work on watercolour paper (Daler-Rowney Langton 300gsm Hot Pressed Extra Smooth) as opposed to the Canson XL Series Mix Media 98lb/160g paper. The Tombow inks move well (but differently) with water on either paper though they do seem extra 'bright' somehow on the watercolour paper. I also discovered that using a conventional Sable brush as opposed to a synthetic water reservoir brush helps to eliminate any hard lines & moves the colour about more effectively. Again I have used my Black Page Album Moleskine for mounting the squares. A wonderful selection of squares and the colour choices are brilliant and show up so well against the black. A superb array of tangling and colours Paula, you really have mastered the technique so very well. It's impossible to choose a favourite here but I am rather drawn to the chocolate coloured diamonds and the graduation of pink coming from the outside. Love them all Paula! Couldn't choose a favourite as they are all gorgeous! Cushions of gorgeousness with wonderful weaving's, a truly super selection Paula. Off to check out the challenge at CB.